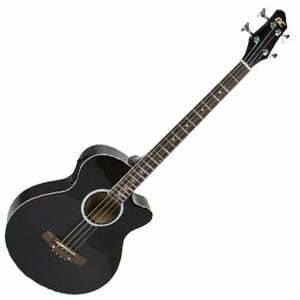 When it comes to finding the best budget acoustic bass guitars, many find themselves limited in terms of choices. Best Choice EAB solves this problem in an affordable and elegant way. Although it might not be the most refined model on the market, EAB offers a lot for the price. When you are dealing with budget brands, the general expectation of quality in terms of tonewood is pretty low. With that said, Best Choice EAB has a couple of tricks up their sleeve. For starters, they don’t really state what kind of wood was used to construct the body, however – under that glossy black finish – we suspect it is something like nato on the back and sides, with spruce on the top. The only thing to keep in mind is that laminated wood is the standard in this price range. Even so, build quality on one of these basses is pretty surprising. You won’t get top tier level, but you are definitely getting your money’s worth. The only thing to look out for is quality control. There is a tangible lack of consistency, although Best Choice has a great return policy. Overall, this bass guitar is put together really well all things considered. Moving on to hardware, we have a fairly familiar sight. Looking at the headstock, you will see a set of die cast machines which are about average when compared to models from the same market segment. They may feel cheap and look rough, but they do a relatively decent job at retaining a key. On the other end we have the bridge and saddles. Both seem to be synthetic, but again do a good job. If you are wondering whether or not this bass will give you troubles in terms of key retention, you shouldn’t expect anything bad. Additionally, there is a built-in preamp – this is a simple one but it still offers 4-band EQ including a master volume control. For the most part, it does a good job at rendering the natural sound of the guitar and sending it to your amp. Of course, you can always do some tone shaping outside this system. Right out of the box, the performance of your Best Choice EAB may vary. We can attribute this to spotty quality control. As we have just said, the best way to solve this issue is to do a proper setup job. Not only will doing so fix whatever quality control issues there may be, but you will also get a much better sound overall. Aside from that, Best Choice EAB sounds very good for its price. Lows are nice and articulated, which completely overshadows whatever muddiness there may be. As you move down the neck, you will find that higher pitched perform the same. Overall sound is rather warm with a bit of a sparkle in the trebles, but ultimately decent projection. When plugged in, you get a decent amount of volume as well as a good render of the acoustic sound. What Best Choice EAB offers is a good enough way to experience acoustic bass, without spending too much money. This is a great choice for both beginners as well as those who want to dip their toes in this type of basses. Despite all of its flaws, this guitar rocks. For more info about the Best Choice EAB, click here.